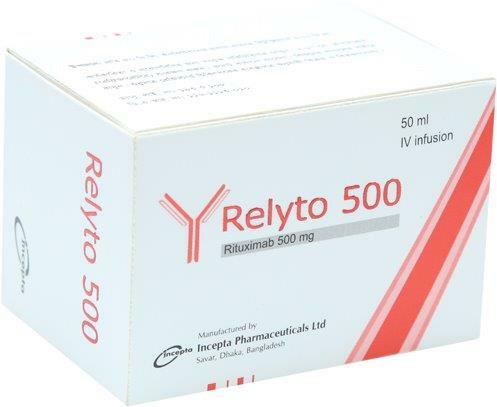 Relyto 100: Each 10 ml solution for infusion contains Rituximab 100 mg.
Relyto 500: Each 50 ml solution for infusion contains Rituximab 500 mg.
Rituximab is a genetically engineered chimeric murine/human monoclonal IgG1 kappa antibody directed against the CD20 antigen. 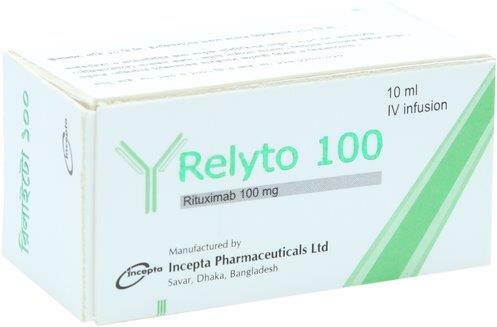 Rituximab has an approximate molecular weight of 145 kD. Rituximab has a binding affinity for the CD20 antigen of approximately 8.0 nM. - The dose for RA in combination with methotrexate is two-1000 mg intravenous infusions separated by 2 weeks (one course) every 24 weeks or based on clinical evaluation, but not sooner than every 16 weeks. Methylprednisolone 100 mg intravenous or equivalent glucocorticoid is recommended 30 minutes prior to each infusion. - The dose for GPA and MPA in combination with glucocorticoids is 375 mg/m2once weekly for 4 weeks. There are no adequate and well-controlled studies of Rituximab in pregnant women. Women of childbearing potential should use effective contraception while receiving Rituximab and for 12 months following treatment. Rituximab should be used during pregnancy only if the potential benefit justifies the potential risk to the fetus. It is not known whether Rituximab is excreted in human milk. Published data suggest that antibodies in breast milk do not enter the neonatal and infant circulations in substantial amounts. The unknown risks to the infant from oral ingestion of Rituximab should be weighed against the known benefits of breastfeeding. Safety and effectiveness of Rituximab have not been established in pediatric patients.